Each episode of Malcolm Gladwell’s podcast begins with a simple inquiry — it could be about an event, a person, an idea or even a song. But by the time it’s over, your mouth’s agape and you’re questioning everything you know. “I literally would do a story on anything,” he told Poynter. Ain’t that the truth. Now halfway through its second season, Revisionist History tackles topics ranging from top-secret Pentagon projects and American civil rights, to the usefulness of political satire and the philosophy of golf — all with the goal of retelling a story that Gladwell thinks is misunderstood. He dissects each topic with laser precision, employing the help of other journalists, government officials and experts to reveal unusual facts and sordid tales about the past. 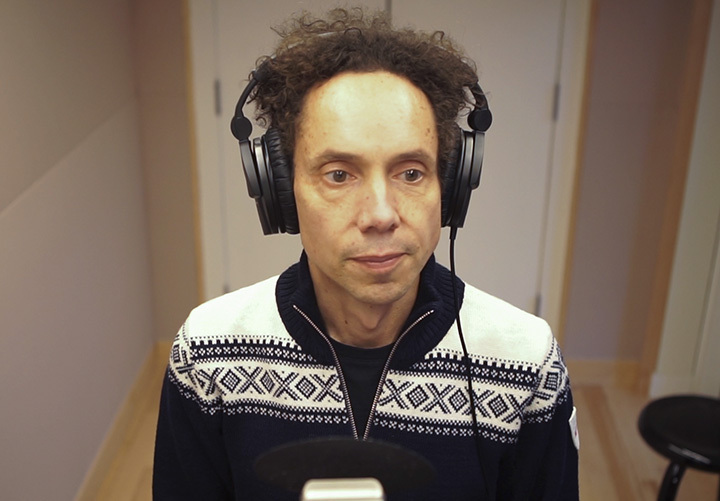 Gladwell, a Canadian journalist and best-selling author, has been a staff writer at The New Yorker and written several books, but Revisionist History is his first foray into the world of audio — and a successful one at that. The podcast, which launched last summer and is produced by Panoply Media (a podcast network owned by The Slate Group), won a Webby Award this year for the best individual episode in the Podcasts and Digital Audio category. The show has five stars and nearly 12,000 ratings on iTunes, but Gladwell’s motivations for creating Revisionist History were more personal. Poynter caught up with Gladwell to talk about how he selects stories for the podcast, his transition from long-form writing to audio and the limits of retelling history. This Q-and-A has been shortened for clarity. Your podcast is easily one of the most interesting I’ve listened to. How did you come up with the idea for it? My friend Jacob (Weisberg), who runs (The Slate Group), came to me and said, “You should do a podcast,” so I said sure. The title Revisionist History is so broad that it covers anything I want to talk about, that’s why I chose it as a title. I just wanted an excuse to talk about whatever was on my mind and whatever I came across. That was the genesis of the idea, that between those two words — “revisionist” and “history” — you can talk about anything under the sun. Coming up with the original episode ideas, 10-15 per year — that’s the real challenge. So far, knock on wood, it’s worked out, but to the extent that I worry about next season, I worry that I can’t come up with another 10 good ideas. Talk a little about how you pick out stories for the podcast. It seems like the subjects are really varied and in-depth. How do you go about deciding what stories to cover? The thing that took me a little while to figure out, because I’ve never worked in audio before, is you need tape. You have to have some reason why people are listening as opposed to reading. When I started, I had this naive notion that I was simply writing articles and then reading them on the air, and that’s not what a podcast is. You have worked for The New Yorker and written several books. What made you want to make the transition to audio? Really curiosity; I wanted to know what it was like. I knew that podcasts were becoming a thing — like everyone else under the sun, I listened to Serial. I wanted to know if this is something I would enjoy doing, and I love how straightforward it is to reach your audience. They sign up, you stick it on iTunes and boom — you reach them. There’s no middle person, there’s no distribution. It just seems incredibly simple and clean, and that’s very appealing to me. I’m used to writing books where months pass between when you hand something in, or years can pass when it actually appears. And this just seems so elegant and simple by comparison. Going back to the Los Angeles golf course episode, that one really stands out as an episode in which your personal experience influenced the subject matter. How do your views influence the types of stories you cover and the way you cover them? Most of my writing is not very personal, so I thought what would be fun about doing a podcast is it would allow me the opportunity to be personal. So I deliberately, more so in this season than the first season, generated story ideas out of my own experience and injected myself in stories way more. This one was an obvious one; I go to L.A. all the time, I’m always running around Brentwood Country Club, I’m always annoyed that I can’t run on the golf course. And so I thought this was a fun excuse to do a really fun story about why I can’t run on the golf course. The medium is very personal, way more personal than print. People are hearing your voice, so it’s much easier to tell personal stories than it is in print, at least I feel that it is. Let’s talk about the title of your podcast. How is it related to the concept of revisionist history in general, and how is it different? You know, revisionist history — its real-world use — is a derogatory term usually. It’s used to kind of disparage something, someone who’s doing a kind of self-serving or illegitimate rending of history. I thought it was kind of funny to kind of reclaim that term and put a positive spin on it, but also it captures the spirit of the podcast. The podcast is supposed to be, I’m trying to stir up controversy, and occasionally having a little bit of fun, so I don’t mind a term that has a little bit of its own history. If you like, I’m doing a revisionist history of the term revisionist history. I like the idea that that term is a little bit loaded, because it signals my own kind of playful intentions. How have you gone about navigating episodes about communities of color and other minorities throughout history? In this current season, I have four episodes on civil rights; two have aired, two more are coming. You know, my approach to the stories is colored by my own background. I’m of mixed-race heritage, so I have a sort of emotional affinity for this story and a point of view, and that point of view is also slightly different because I’m not an African American. I come from another culture entirely. It’s a kind of semi-outsider’s perspective on American civil rights that I bring to the story. But other than that, in its broadest sense, my approach to those kinds of stories is not different from my approach to any story, which is: I do my reporting, I have a story I want to tell and I tell it the way I want to tell it. I don’t feel like there are any special rules for those kinds of stories, other than you should be intellectually honest and do your homework and have a defensible point of view. Do you think there’s a perfect account of events? No, I don’t. You know, our understanding of the Holocaust is as close as we can come, in a sense that so much really good work has been done in trying to understand that event, that if you were to hypothetically read all of it, I feel like you would see that event from every conceivable angle. That’s the best we can do, is have lots and lots of very smart, thoughtful people carefully take a look at something, each from a slightly different perspective. So maybe when we sum it all up, we get something close to understanding, or at least a knowledge of all the ways to think about an issue. But that’s rare, you know, because that’s such a kind of extraordinary event that it’s not often that we get such depths of scholarship and appreciation of what happened. Which of the episodes you’ve done so far do you think has gotten closest to that ideal? That’s really hard to say. I’m not trying to give a full accounting of the events I’m talking about; I’m trying to give a very specific perspective. But I was very pleased with “Miss Buchanan’s Period of Adjustment.” It was a difficult episode to do, but I thought in the end we did a good job of bringing a kind of fresh perspective to a story people thought had been told before. And that was one where, I have a series of really good people who work with me, but one of my principal editors — a woman named Julia Barton — she took a pretty weak first draft and helped me turn it into a much stronger version. It’s funny, because I have my perspective on how to tell the story, and then I give it to someone like Julia and she gives me her perspective, so we’re doing a version in the production of the story of the thing I’m talking about. In the end, that episode is me plus Julia, so it’s a kind of revision of my revision of the history. Maybe I’m getting too meta, but it’s just kind of funny. How does the production influence the storytelling and how does the storytelling influence the production? The production influences the storytelling hugely, because I’m not a radio person and I have a series of people, but principally a woman named Mia Lobel — who is my producer — and Julia Barton, my editor, who are radio people and know the medium really well. Because I’m telling these stories as if they’re print articles, and they look at it and say, “Well actually, Malcolm, it’s not a print article — you have to take advantage of this medium.” So they’ve been enormously, crucially important in shaping these stories. The distance between my first drafts and what the viewer hears is considerable. When you first started the podcast, what did you think it was going to be like, how did it turn out and how do those two things compare? It started out as a lark; I just thought it would be really easy to do. I would dash it off, and then I’d go back to my writing. It turns out not to be a lark — it turns out to be an enormous amount of work. But it turns out to be a lot more satisfying than I had imagined, and it turns out that I like the medium way more than I thought. So it is so different from what I had imagined; it’s like night and day. I feel like I’m still learning more all the time. Virtually every one of my preconceptions has been turned upside down when it comes to doing this podcast. Correction: An earlier version of this article misspelled Mia Lobel’s last name. We apologize for the error.